This is a strange, double-edged declaration from a memoirist—after all, without what was and what got broken, there is no story to tell. But Joan Didion has never been one to make things easy. 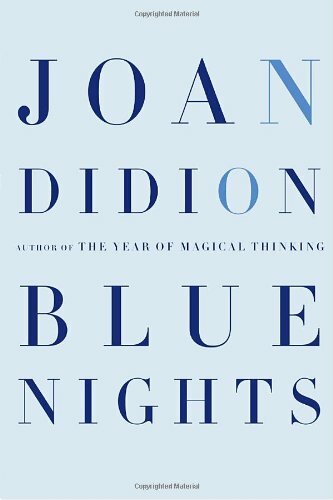 Blue Nights is a sequel to her National Book Award-winning Year of Magical Thinking, which was less a detached remembrance and more an artifact of Didion's grief after her husband, John Gregory Dunne, suffered a heart attack and died in 2003. Dunne and Didion's adopted daughter, Quintana Roo, was comatose in the hospital at the time, mere months after her own wedding, and during Didion's promotion tour for the book, Quintana died of acute pancreatitis—a story she recounts in painful detail in Blue Nights. So while Year of Magical Thinking was the book of Dunne, Blue Nights is the book of Quintana. In it, Didion circles around her memories of Quintana's homecoming, her precocious fears as a child (the child Quintana once coolly informed her parents when they returned home from a social outing, "I just noticed I have cancer"—it was chicken pox), her struggles with depression and anxiety and alcoholism, "her depths and shallows, her quicksilver changes." Tormented by memories of her own failures, Didion wonders if her mothering deficiencies were at the heart of Quintana's problems. What if the problem is now cognitive? What if the absence of style that I welcomed at one point—the directness that I encouraged, even cultivated—what if this absence of style has now taken on a pernicious life of its own? What if this new inability is systemic? What if I can never again locate the words that work? What is perhaps most significant about Blue Nights is that this anxiety, though the particulars change, is not unfamiliar ground for its author. She'll be 77 next month and has been publishing for nearly fifty years, but Didion's writing has always been marked by nostalgia, anxiety, and outright fear—sometimes longing for time gone by, often yearning for a place, frequently seeking or half-remembering something that may never have even existed, a golden age or a myth (like the conception of California that has haunted her). The memoir, by nature, is a form in which the writer mines her own experience, recaptures a single heart's longings, and then shapes them into a narrative that will resonate with the reader as well. And so memoir is often marked by Sehnsucht. Memoirs remember what has passed and long for a chance to revisit, or even attempt to redeem, what is lost. For the memoirist of faith, or the one who wants to believe, this longing finds its culmination in the hope of a world to come. But the memoirist who can or will not hope, who sees approaching death as the final end, the absolute period at the end of the sentence, this is a longing that can never be fulfilled. In this way, Blue Nights is a fitting culmination to Didion's work, a beautiful, heartbreaking testimony from one who refuses to hope. It is a longing for what is irretrievably lost. As Didion says, "In theory these mementoes serve to bring back the moment. In fact they serve only to make clear how inadequately I appreciated the moment when it was here. How inadequately I appreciated the moment when it was here is something else I could never afford to see."